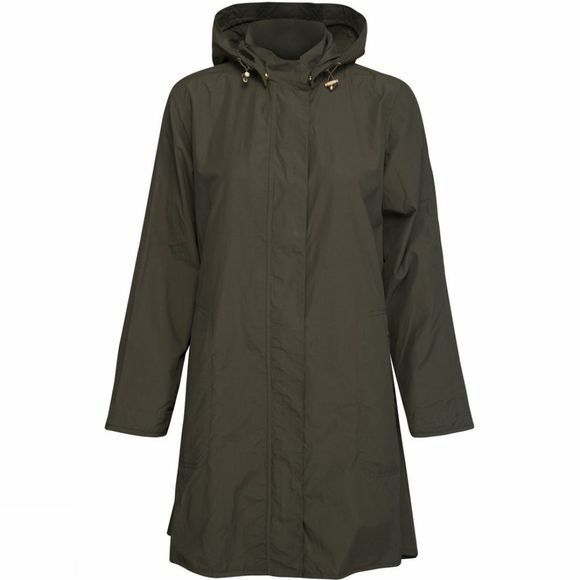 The Women's Coty02 Coat from Ilse Jacobsen combines both style and function, ideal for the unpredictability of Spring. The crisp water-resistant coated fabric and taped inner seams safeguard you against an unexpected shower while out and about in the city, and the adjustable hood can be cinched in to keep out a nippy morning breeze. The full length two-way front zip offers extra freedom and is neatly covered by a placket to provide a smooth finish, and the slightly curved hem is accented with a button detail on each side which adds a touch a style. Two zipped pockets keep essentials such as your keys and wallet safe and secure.